BLACKSBURG, Va., March 2, 2016 – Aquatic life can suffer when high concentrations of dissolved salts enter freshwater ecosystems, a process known as salinization. An international, multi-institutional team of researchers that includes a Virginia Tech graduate student recommends ways that humans can protect freshwater from salts in a recent article in the journal Science. The recommendations include the use of less water for agricultural practices, less salt for road de-icing, less discharge or sequestering salts during mining operations, and re-routing of urban salt discharges to retention basins rather than treatment plants or streams. “We’ve written the paper as a call to action, or at least a call to awareness, and we’ve tried to describe what we think will be an effective path forward,” said Tony Timpano of Herndon, Virginia, a doctoral student in the Department of Forest Resources and Environmental Conservation in the College of Natural Resources and Environment. Increased salinization in freshwater is an issue that hasn’t gotten much attention in terms of science policy, according to Timpano. Dissolved salts and other minerals are naturally found in streams, but increased levels can be toxic to aquatic invertebrates that are an important component of freshwater ecosystem food webs. At extremely high levels, salt can kill fish and other organisms that humans rely on for food. 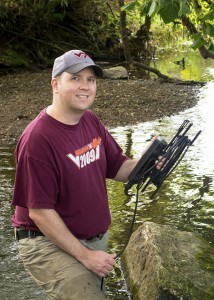 Since 2008, when he began a master’s program in environmental sciences and engineering at Virginia Tech, the focus of Timpano’s research has been changes in biodiversity of the aquatic insect community as salinity increases in Appalachian freshwater streams. Of the two dozen streams that Timpano monitors, those located near coal mining operations have shown the highest salt concentrations and insect losses. Now in his third year as a doctoral student, and a member of the Interfaces of Global Change interdisciplinary graduate education program, Timpano is working on his dissertation but says he plans to continue working with the group of co-authors — a multi-disciplinary global advisory group to the Society of Environmental Toxicology and Chemistry. Timpano is also advised by Carl Zipper, a professor of crop and soil environmental sciences in the College of Agriculture and Life Sciences. Timpano’s research is supported by the Institute for Critical Technology and Applied Science, the Virginia Water Resources Research Center, the Department of Interior Office of Surface Mining Reclamation and Enforcement, the Department of Forest Resources and Environmental Conservation, and the College of Natural Resources and Environment. Timpano and Schoenholtz are both affiliated with the Global Change Center, which is an arm of the Fralin Life Science Institute.